Reading and share top 5 famous quotes and sayings about Diamonds In The Rough by famous authors and people. 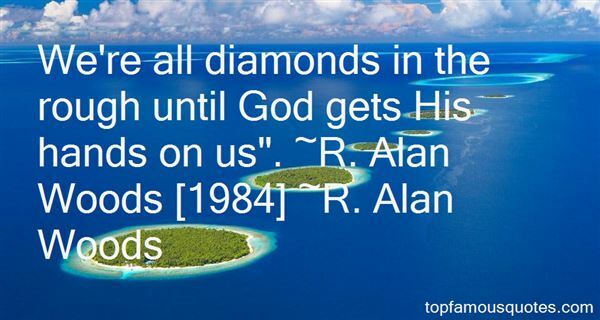 Browse top 5 famous quotes and sayings about Diamonds In The Rough by most favorite authors. 1. "As hard as the diamonds in your smile,the wind carries its hammers with no handsand sustains a moan with no mouth,seems to cradle solitude in its rough arms like firewoodto be burned in my house as it passes throughand asks, "Where does she sparkle from?" 2. "When she spoke, the words were rote, taught to her by her captors, dead and empty, and forced. 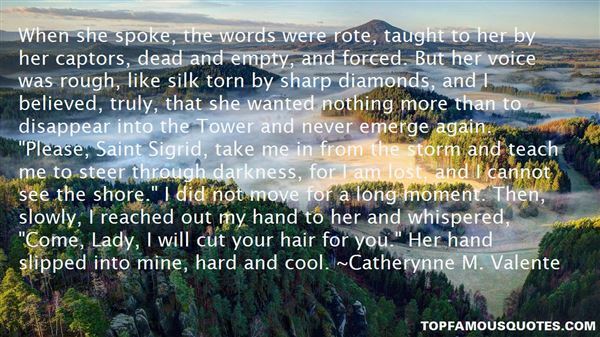 But her voice was rough, like silk torn by sharp diamonds, and I believed, truly, that she wanted nothing more than to disappear into the Tower and never emerge again. "Please, Saint Sigrid, take me in from the storm and teach me to steer through darkness, for I am lost, and I cannot see the shore." I did not move for a long moment. Then, slowly, I reached out my hand to her and whispered, "Come, Lady, I will cut your hair for you." Her hand slipped into mine, hard and cool." 3. "Riley found her friend studying the contents of one of the store's display windows. It was full of sparkle. "How do you catch this thing?" he asked.She dug in her bag, pulled out a sippy cup, and handed it to him. "You're joking, right?" he said. "You trap demons with cups that have dancing bears on them? "She glowered at him. "See the glitter in the bottom? Klepto-Fiends can't resist it. "He held up the sippy cup and compared it to the exquisitely cut diamonds in the store window. "Wanna bet? "And I brought him along why?" 4. "I come home from work this eveningthere was a note in the frying pansaid Fix Your Own Supper Babe I Run Off With The Fuller Brush ManWell I sat down at the tablescreamed & hollered & criedI commenced to carring on'till I almost lost my mindand I miss the way she used to Yell At Methe way she used to Cuss & Moanand if I ever go outand get married againI'll never leave my wifeat homeThe Frying PanDiamonds In The RoughJohn Prine"
5. "We're all diamonds in the rough until God gets His hands on us". ~R. Alan Woods "
At eighteen there was one thing I was certain of—the world was at constant war. The reason why—I didn't know, I wasn't allowed to know. I asked too many questions, but all I wanted to know was the truth. The only problem was that the truth was so far gone not even the ones that created the ocean of lies I was drowning in knew its depths."